The games, the characters, the legacy. Welcome to our site! From old school to new cool (and everything in between), this site is dedicated to everything Nintendo. Please check back often, new content arrives every week. NEW! Do you have something Nintendo related you'd like to share on this site? Check out our new User Content page to find out how. NEW! Donkey Kong page! Check out this page for everything DK including past releases, history and more! The history of NIntendo dates back to the late 1800's. Visit this page to review the company's history starting with the early days. What gamer hasn't owned at least one Nintendo system over the years? Take a look at the entire Nintendo console lineup here. Games. And lots of them. From Animal Crossing to Zelda, they span the course of decades. Which ones made an impact on you? 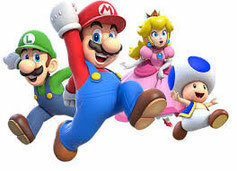 Yoshi's New Island for the 3DS and Dr. Luigi for the Wii U are two of the most exciting games from Nintendo. Two of the biggest company hits are making their way to the Wii U in 2014: Mario Kart 8, and Super Smash Bros. U! Mario Kart 8 is scheduled for May 30, and Super Smash Bros. U is "to be announced". Thank you for visiting www.nintendosite.jimdo.com. Copyright 2014.